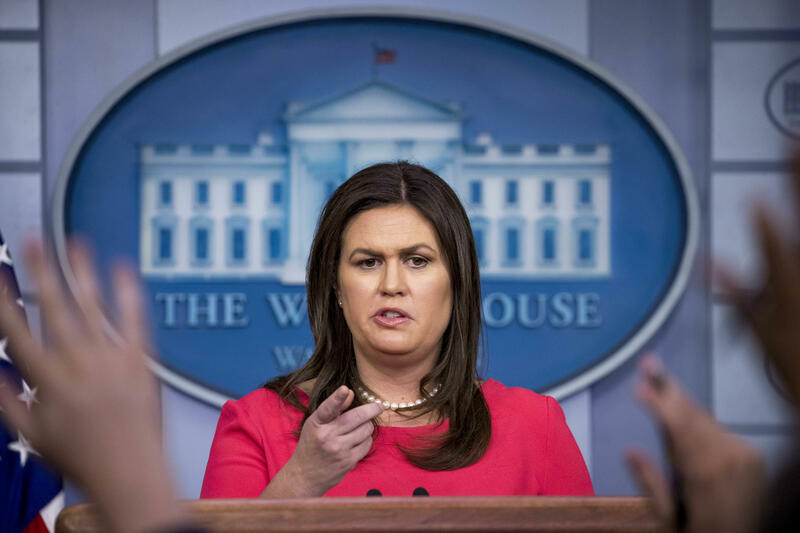 White House press secretary Sarah Sanders said Wednesday that President Trump would discuss a Russian proposal to question American citizens, including former U.S. Ambassador Michael McFaul, whom the Kremlin accuses of committing crimes in Russia. "Russian authorities yesterday named several Americans who they want to question whom they claim were involved in quote-unquote crimes in their terms, including former Ambassador to Russia Michael McFaul. Does President Trump support that idea? Is he open to having U.S. officials questioned by Russia?" New York Times reporter Maggie Haberman asked Sanders. Sanders replied that an announcement would be forthcoming on the Russian proposal after Mr. Trump discussed it "his team." "The president's going to meet with his team and we'll let you know when we have an announcement on that," Sanders said. When pressed on whether Putin had raised the idea with Mr. Trump, Sanders said that there was "some conversation about it," but that there "wasn't a commitment made on behalf of the United States." According to a proposal outlined by Putin at Monday's Helsinki summit, Russian authorities would observe the interrogation of the Americans. In exchange, special counsel Robert Mueller would be allowed to witness the questioning of 12 Russian nationals the U.S. has indicted for allegedly participating in election interference. Later in Wednesday's press conference, CBS News' Steven Portnoy raised the issue again. Portnoy noted that Mr. Trump had called the Russian proposal an "interesting idea" and an "incredible offer" in Helsinki. "Why would he say that?" Portnoy asked. "[Mr. Trump] said it was an interesting idea," Sanders replied. "He didn't commit to anything. He wants to work with his team and determine if there's any validity that would be helpful to the process. But again, we've committed to nothing, and it was an idea that [the Russians] threw out." In addition to McFaul, the Russian government also looking to question Putin critic Bill Browder, whose attorney Sergei Magnitzky died under suspicious sanctions while in Russian custody. It also wants to question former congressional aide Kyle Parker, who drafted a series of sanctions known as the Magnitsky Act, which Browder lobbied for. "I hope the White House corrects the record and denounces in categorical terms this ridiculous request from Putin," McFaul tweeted after the press conference. "Not doing so creates moral equivalency between a legitimate U.S. indictment of Russian intelligence officers and a crazy, completely fabricated story invented by Putin."